Synopsis (from the publisher): A Chinese National working for an American-owned construction company is grabbed off the streets of Shanghai in broad daylight. His one-man security detail goes missing as well. Rutherford Risk is a firm specializing in extraction: the negotiation for, and the recovery of hostages. Private investigation is illegal in today's China. Operating within her borders will be difficult at best. The security company recruits two unique outsiders to do their bidding. Grace Chu is a forensic accountant hired to follow the money; John Knox is a civilian with unparalleled training in both combat and culture. 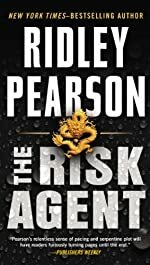 Grace's top-notch American education and Chinese military service make her an unassuming, but effective, operative, while Knox's take-no-prisoners attitude brings them perilously close to harm. Following the money leads to more complex – and dangerous – consequences than either anticipated. Who is actually behind the kidnapping? And more important, can Knox and Grace locate the two hostages ahead of the deadline?